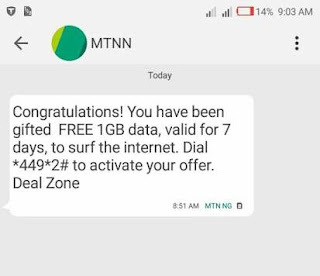 It's a happy period for MTN Nigeria subscribers as MTN is given free 1GB data to be used for Chatting and browsing your favorite social media platforms and websites. This data Awoof is coming at a time MTN NG is still splashing free 100MB for some subscribers that downloads MyMTN App, just as 9Mobile is giving Free Data for customers that downloads 9Mobile app. Note that this MTN free 1GB Data is different from lasts years 1GB Free data via IMEI tweaking. In this case, you don't need to tweak any imei or use any VPN app to activate it. It's simple, if you received an SMS from MTN confirming its free 1GB data, it means you are eligible and have gotten the MTN Free 1GB Data to chat on whatsapp and brows. This data is valid for 7 days only. Alternatively, to know if you got this free data, dial this code *559*4# to check your data bonus to confirm if you have been given or not. SEE ALSO: How To Get Free Unlimited Data On All Networks. Let's know if you also got free data from MTN.